The larger part of the regiment consists of musketeers. Their main weapon is a musket, usually a matchlock, but they also carry a sword. The musket is a muzzle loading weapon which relies on a charge of gun powder ignited by a length of cord or 'match' soaked in saltpetre. Numerous commands are required to prepare and fire it, so the rate of fire is fairly slow and largely ineffective unless fired en masse. Each man carries his own supply of powder in a dozen small flasks attached to a bandolier - a belt slung across his torso. Other musketeers may carry a 'firelock' (more commonly known today as a flintlock). The powder is ignited when a flint strikes a metal plate (the frizzen) and produces a shower of sparks. Although the lock mechanism is more complicated than the matchlock, the loading procedure is simpler. Rather than wooden bandoliers, ammunition is usually carried in a belt pouch in paper cartridges. In the regiment these musketeers are usually grouped together in the Firelock division. 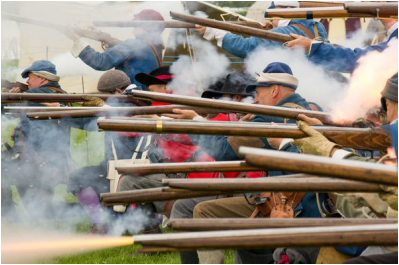 New recruits will be able to borrow the majority of the equipment for the first few musters, including a dummy musket. To become a fully-fledged firing musketeer you'll need a shotgun licence, a black powder licence and a Sealed Knot musketeer's card (issued after successful completion of the Sealed Knot musket test). Rupert's Firelocks is another identity assumed by some members of this division at certain events, where they don the red coat of Prince Rupert's Lifeguard of Foot.